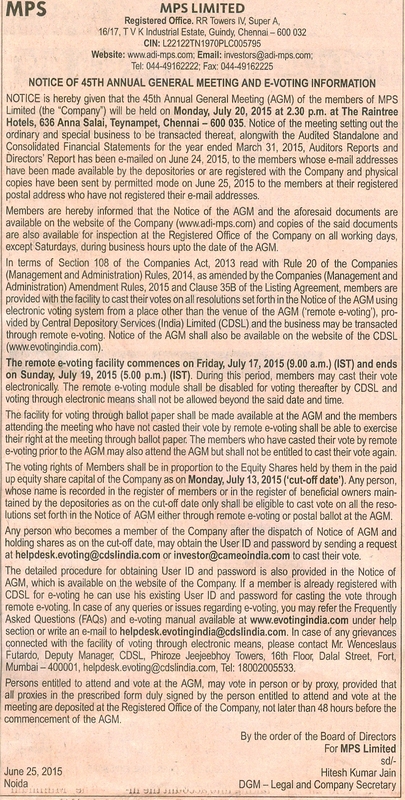 Notices and Voting Results - MPS Ltd.
Click here to read the Advertisement of 47th AGM Notice English Language. Click here to read the Advertisement of 47th AGM Notice Tamil Language. Click here to read the 47th AGM Notice. Click here to read the Advertisement of 46th AGM Notice English Language. Click here to read the Advertisement of 46th AGM Notice Tamil Language. Click here Book Closure Notice English Language. Click here Book Closure Notice Tamil Language. Click here to read the 46th AGM Notice. Click here to read the 45th AGM our Book Closure Notice. Click here to read the 45th AGM Notice. Click here to read the Postal Ballot Notice, 2015.